Page 10-11: Opening page makes it really feel like a Part 2. 15: Always lock your door, people. 16: Come on. Some fanservice please, Kyo? 17: Always volunteer others for dangerous missions. 21: Here’s a pair it seems like we haven’t seen in a while. 26: Bravo for not being moody-jealous, Kyo. 27: Oh, yeah. These girls. Didn’t miss them. 29: A wild rival has appeared! 32: Great detective work, Yun-Yun. 37: Sometimes with all the crazy student body presidents in manga, you forget it’s actually supposed to be a serious role. 47: Sure, Tohru. Just look on page 156 in The Dummies’ Guide to Curses. 49-51: I never got this part as a revelation. It just seems really obvious. 57: Kagura meets Kyo after such a long time. 63: Feels like we should play the Nakajima Megumi song “Be Myself”. Go listen to it if you haven’t heard it before. 64: Is it just me, or is Tohru repeating herself a lot in this chapter? “Do you know, do you know”, “Isuzu-san, Isuzu-san”. 67: Well, now we know Rin’s motives. 69: Every now and then, you realize that Tohru has somehow managed to keep the Sohma secret. Although if she was captured and waterboarded, I think Tohru would just keep repeating Kyoko lessons, and her captures would just let her go just so they wouldn’t have to listen to her anymore. 71: There’s a lot of people who’d take that job. 77: Kagura has realized Kyo matured. I think we all miss angry cat-Kyo though. 78: Is drawing eggs fun? Did anybody draw eggs as a kid? Outside of maybe for Easter of course. I mean like fried eggs. 83-84: I wonder if the cat monster was always full-size or if it grows with Kyo. I assume full-size, which would make it really scary for a kid to see Kyo grow into such a large scary form. 86-90: Again, everyone analyzes their feelings too much. 96: Kagura doesn’t look like Kagura here, but it’s definitely a moving image. 103: Oh, so he had fried eggs for breakfast. Still a weird thing to draw. 106: Now this looks like an interesting manga I’d read. 112: Tohru really overreacts to kindness. 115: Did Momiji cut his hair? 119: Nice shot of Haru’s tattoo. 130-131: Rin would make an excellent bodyguard. 133-134: Well, could be worse. Shigure could have asked to meet some middle or high school girls. 142-144: *whistles* Haru claiming his girl. 146-147: Ha ha, Yuki just can’t figure Haru out. Come on, run o trusty steed steer! 151: They would make nice sisters. 156-157: Kind of want the “Tohru’s darkness” arc over with already. 172: An odd pep talk. 175: Mayu wins the Best Face Award. 178: I bet Hatori is going to hear both sides of this encounter. 180: I lied. Blob Mayuko wins the Best Face Award. 182: Actually it’s probably better that Shigure borrowing it. I could see him buying a suit just like Hatori’s, and then Ayame would buy or make another so they could be triplets. 184: Aw, Rin’s so sweet. 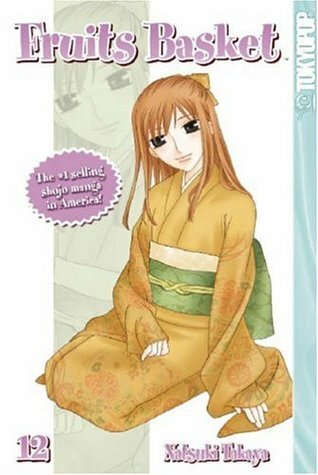 189: I know characters in Fruits Basket lecture about not underestimating others’ pain, but Tohru’s deep, dark secret really is lame. 193: Oyaji moe. Not a lot of oyaji manga in English, but there’s some great titles that deserve an English release. This volume is a bit of a bridge, but it’s definitely not as good as the last volume Hana and Uo make their return, but this volume affirms much of what we already know: Rin is trying to protect the others (especially Haru), Tohru has her own issues, Kyo loves Tohru, and the student council is going to play a big part in Yuki’s life. The biggest moment of the volume is Kagura having to let go of her feelings for Kyo. Hana’s love life also comes into the picture, providing some much needed Kyo harassment. Otherwise, everyone talks about moving forward, but there isn’t much progress in this volume. Maybe next time. Oh, finally reach the halfway mark! (Well, sort of.) Whoo-hoo! So how do I feel so far? Well, I’ve been hard on it in some ways, but it’s not bad. I just don’t know if it’s worthy of its popularity and rave reviews. Drawing eggs is fun and that’s no yolk.